You are constantly reminded to save for retirement. But you are told precious little about ‘where’ to put your savings. Most of you started saving in your IRA or your 401k by setting aside pre-tax dollars, which will be taxed upon withdrawal. Later, the Roth IRA and, for some employees, the Roth 401k became an option. These accounts are funded with after-tax dollars, and will not be taxed upon withdrawal. Many of you have the majority of your retirement savings in tax-deferred accounts and not enough in after-tax accounts. With a better balance between the two, you can better manage your tax liabilities over the course of a lifetime if you are intentional about the actions you take. One of these actions to consider is converting some of your tax-deferred assets to after-tax assets, better known as a Roth conversion. This will involve taxes due, but the long-term benefits may be greater. No one knows what tax rates will be in place when you retire. You might hear that your income in retirement will be lower, therefore your tax rates should be too. You might also hear that with the growing deficits, the only way to pay for it all is to raise taxes. Either, or both, could happen. The fact is we do not know, and having flexibility to manage your taxes is best. Most of us who have saved for retirement have done so in tax-deferred accounts such as traditional IRA’s or 401k accounts. Approaching retirement with Roth account balances (taxes already paid) that are roughly equal to pre-tax retirement savings will offer the greatest flexibility to manage whatever tax rates are in place at that time. Contributions to a Roth IRA are limited by your income. Make too much and you cannot contribute. Conversions are different. There are no income limitations and anyone can make a conversion. Conversion can be done in stages; it is not an all-or-nothing proposition. You choose how much to convert. Perhaps you estimate your income will leave you $50,000 below the next tax bracket. You can decide to convert only $50,000 in 2019 and plan to revisit the same question next year, and the next, until you reach your goal. Taxes will be paid on the $50,000. Pre-tax savings accounts such as traditional IRA’s and 401ks will require that you begin taking distributions when you turn 70.5 years old. And those distributions will increase as you get older and the account(s) are slowly drawn down. With Roth accounts, there are no required minimum distributions. This also offers the additional benefit of allowing you to pass Roth assets along as part of your estate plan. By making your Roth contributions now, the amount of taxes you will be required to pay in the future is reduced, at a point where you may be less able or willing to do. It will also help with your planning, knowing your Roth assets don’t need to be discounted by any taxes due on distribution. 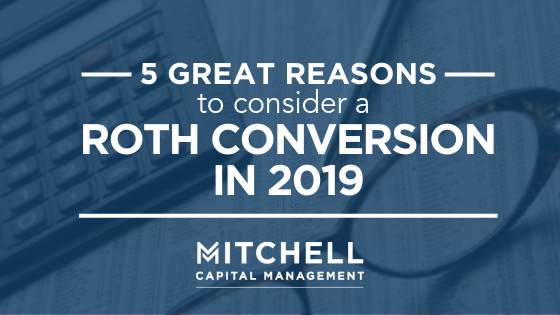 Roth conversions aren’t for every situation, but for many investors they are an integral part of a smart, intentional, long-term financial plan.